The Mirage Hotel Las Vegas is a 3,044 room hotel and casino resort located right next to the Las Vegas Strip in Nevada. The Mirage Hotel Las Vegas is connected by a free tram to Treasure Island. The marquee in front of the Mirage is the largest free standing marquee in the world. The Mirage Hotel Las Vegas was built by developer Steve Wynn and designed by Joel Bergman. It opened in November 1989 and was the first resort that was built with the money of Wall Street through the use of junk bonds. It was built on the site, formerly occupied by the Castaways Casino and previous to that, the Red Rooster Nite Club. 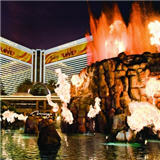 The Mirage Hotel Las Vegas was the most expensive hotel/casino in history, with a construction cost of US$630 million. 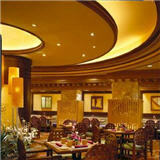 The Mirage Hotel's distinctive gold windows get their color from actual gold used in the tinting process. It was reported that the resort would have to bring in a million dollars a day to pay off a 7-year construction loan. But in fact The Mirage Hotel and Casino did so well, the loan was paid off in just 18 months. The construction of the Mirage is also considered very noteworthy in that Wynn had set a new standard for Vegas resorts, and is widely considered to be the father of today's Las Vegas. Prior to The Mirage Hotel's opening, the city was experiencing a decline in tourism that began in the 70s. At that time, the state of New Jersey legalized gambling, and tourists (in particular those on the East Coast) began to frequent the casinos of Atlantic City. Also, this was a time when Las Vegas was no longer considered a fashionable destination, so a new, high-profile, project was necessary to jump-start the ailing industry. When it opened, The Mirage Hotel Las Vegas was the first casino to use security cameras full time on all table games. 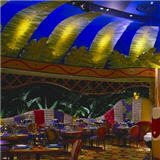 From 1990 through 2003, The Mirage Hotel and Casino was the venue for the Siegfried & Roy show. The two headliners combined magic and the use of wild animals. The closing of the popular attraction in 2003, after Roy Horn was injured by one of the white tigers used in the show, affected The Mirage Hotel for a while. In 1993, The Mirage hosted an extended run of the Cirque du Soleil show Nouvelle Expérience in a tent in The Mirage parking lot. It was during this time that Steve Wynn decided to invite Cirque to create Mystere for the soon-to-be-built Treasure Island resort next door. 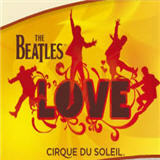 Finally returning to where they began in Las Vegas, Cirque du Soleil has a permanent production at The Mirage, Love. In 2004, Danny Gans took over the main marquee becoming the resort's main entertainment attraction. Gans left The Mirage in 2009 to star in a show at the Encore Las Vegas but unfortunately died before he can get started there. In December 2006 the Beatles-themed REVOLUTION ultra-lounge opened. It is the first time Cirque du Soleil was involved in the development of a nightlife venue, operated by Light Group Las Vegas. In 2009, ventriloquist and 2007 America's Got Talent winner Terry Fator began a 5-year run at the hotel. Also in 2009, The Mirage Hotel was featured on The Amazing Race 15, where one team member had to bungee the other into the air to grab a bouquette of flowers presented in the Love theater.
. Stratosphere Hotel, How High Is It?